The Ben Pauling-trained Kildisart (8/1) shouldered top-weight to land the £75.000 Betway Handicap Chase over three miles and a furlong. Having his first start over today's trip, the seven-year-old son of Dubai Destination produced a smart leap at the last under Daryl Jacob and ran on strongly in the closing stages to score by five lengths ahead of the Colin Tizzard-trained Mister Malarky (11/2) in second. Kildisart is owned by Isaac Souede and Simon Munir and previously finished fourth in the G1 JLT Novices' Chase at last months Cheltenham Festival. Pauling said: "That was good. He ran so well at Cheltenham but we were just lacking that gear coming down the hill and finished off very well. "To carry top-weight around here is no easy feat, so maybe he is improving still, which is great. "The step up to three miles has obviously worked. He has always been a lovely horse but he deserved a big one today and it's great to get it in the bag for Simon, Isaac, Anthony (Bromley, racing manager)and everyone behind the scenes at home." Racehorse owner Simon Munir will need throat lozenges if Valtor wins today's Randox Health Grand National. At Aintree today his racehorse-owning partner, Isaac Souede, said: "Simon could not be here today because he is at a wedding in Abu Dhabi, but if Valtor wins the National we'll hear his roar. There is going to be a sonic boom, because Valtor is really his project. "Nicky hasn't said anything about the horse's chance, but judged on the way he ran in France we think he's got a shot." Souede was speaking after top-weight Kildisart, who he owns with Munir, won the Betway Handicap Chase under Daryl Jacob for Ben Pauling's stable. The owner continued: "I'm really pleased for Ben that the horse has run as well as he has, and I'm pleased for the horse - that's more important than where it happened." Kildisart (8/1) beat Mister Malarky (11/2) and Oldgrangewood (7/1) by 5l and 4l, with Gold Opera (50/1) taking fourth. Jacob said of the winner: "It was a massive performance. I thought he might have been high enough in the handicap coming into a very competitive race like this, but he is an improving horse. 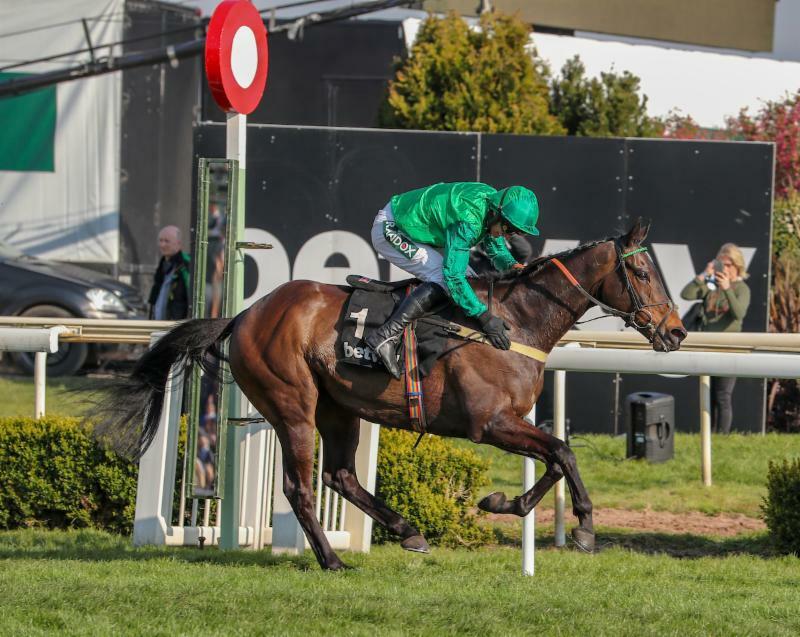 "I thought his run in the JLT [at Cheltenham, when fourth] was very good - he got outpaced coming down the hill but then really stuck to his guns coming up the hill and stayed on really well. I suppose his handicap rating was fair and he has probably improved a little bit from Cheltenham to today, so I am delighted. "We have always felt that he wanted today's sort of trip [three miles] and we were quite surprised when he was winning over two miles over hurdles. He surprised us but that just seems to be his nature - he has kept improving every year that we have had him. It's a wonderful way for him to finish off his season. "All our horses ran really well in the handicaps at Cheltenham, they were finishing second and getting beaten by short distances. It was a frustrating time but fair play to Simon and Isaac. I am delighted for those guys and for Anthony [Bromley, racing manager], who puts so much effort and hard work into placing the horses for us. We are very, very lucky people." Mister Malarky (11/2) has had a smashing season through 2018-19, winning three times, and today the son of Malinas added a second to his seasonal CV in the Betway Handicap Chase over three miles. Trainer Colin Tizzard said: "I think that has been his best run this season, he is related to Dubacilla [second in the Gold Cup] and we always thought that fences would be his thing and you never know until you try them. "He is a strong stayer now, and there were the two top-weights fighting it out. I thought going to the last we had a chance, but we clobbered it a bit and we got a bit tired. "There is a big future for his young jockey [Jonjo O'Neill] and he gave him a lovely ride." Mister Malarky could be one to come back to Aintree next year for the big race itself. "I just mentioned that possibility to Wendy [Hezel, owner] - I thought we'd sow the seed now! This horse has a lovely future, so has that jockey - I will try and get my hands on him!" laughed Tizzard. Third, at odds of 7/1, was Oldgrangewood, trained by Dan Skelton and ridden by his brother Harry. The eight-year-old son of Central Park finished four lengths behind Mister Malarky. Skelton said: "Another good run. He'd probably given his running by the time he came to the last and just hung on for third. We'd set out our stall quite early in the year that this was where we were going to come, and we knew what we had to do to beat the established horses, and we got beat by two that were fourth in the RSA Chase [Mister Malarky] and the JLT Chase [winner Kildisart] at the Cheltenham Festival." Craig Nichol, jockey of fourth-placed Gold Opera, returned to the winner's enclosure on foot, but there was no problem with the horse. He explained: "He's fine, but my saddle slipped at the second last. I might have been third otherwise."